4-H and FFA Livestock Shows are held in Burton Coliseum and in the Burton Ag Arena. See Detailed Schedule below on this web page. Admission to all livestock shows is FREE to the public! Updated 2019 Livestock Show Schedule Coming Soon! The Mission of the Southwest District Livestock Show, Inc. is to foster opportunities for 4-H and FFA youth from across a seven parish area to develop life skills through raising and exhibiting livestock projects. Area youth gain knowledge and skills such as responsibility, communication, record keeping, and leadership through this process. The Southwest District Livestock show supports these area youth with scholarships, awards, and prize premium monies to encourage participation - awarding over $75,000 annually to participants in these activities. Each year, more than 1,800 youth participate, exhibiting over 3,000 head of livestock. 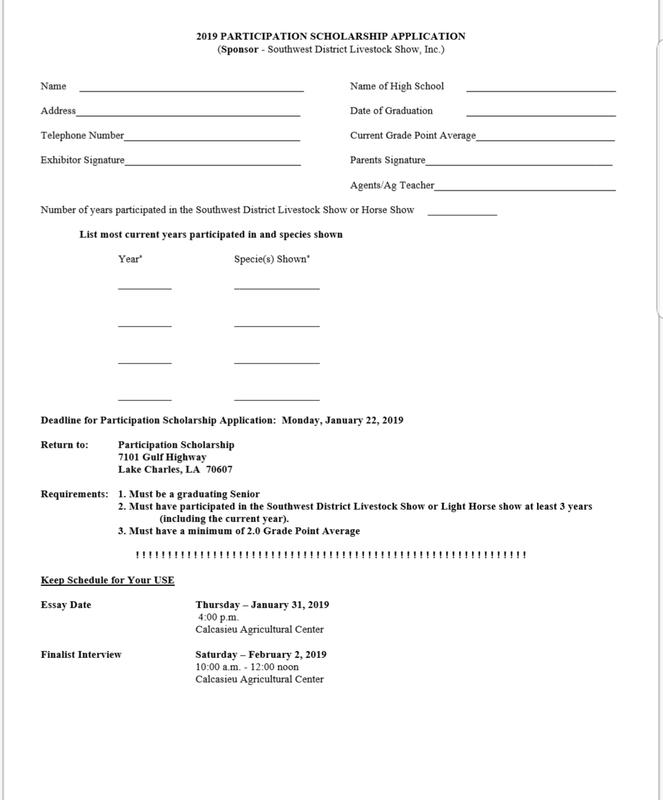 If you have participated in the District Livestock Show and/or Light Horse Show for at least 3 years, are a graduating senior, and have maintained a GPA of 2.0 or higher, we invite you to apply for the Participation Scholarship. Please download the application below. All applications must be submitted by January 22, 2018 to the address on the application. If you have further questions about the process, please contact the office at 337-721-4080 or email Mr. Jimmy Meaux at JMeaux@agcenter.lsu.edu.